The Global Volcanism Program has no activity reports for Etorofu-Atosanupuri [Atosanupuri]. The Global Volcanism Program has no Weekly Reports available for Etorofu-Atosanupuri [Atosanupuri]. The Global Volcanism Program has no Bulletin Reports available for Etorofu-Atosanupuri [Atosanupuri]. 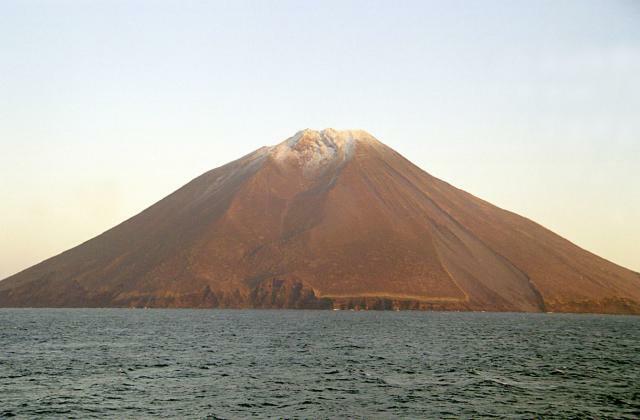 The conical Etorofu-Atosanupuri stratovolcano forms a prominent peninsula joined to the SW side of Iturup (Etorofu) Island by a low isthmus only 30 m high. A somma volcano whose caldera rim is exposed only at about 900 m elevation on the SE side was constructed during the late Pleistocene or early Holocene, forming an island up to about 1.5 km high that was later connected to the main island by erosional material. A fault with large displacement offsets the NW side of the somma. The 2-km-wide caldera was subsequently largely overtopped by a central cone that forms the present summit. Strombolian eruptions have dominated the history of this basaltic volcano; few lava flows are exposed. Only two historical eruptions are known, during 1812 and 1932. There is no Deformation History data available for Etorofu-Atosanupuri [Atosanupuri]. There is no Emissions History data available for Etorofu-Atosanupuri [Atosanupuri]. Atsonupuri stratovolcano forms a peninsula jutting into the Sea of Okhotsk. Seen here from the NE, it is joined to the southern end of Iturup Island by a low isthmus only 30 m high. 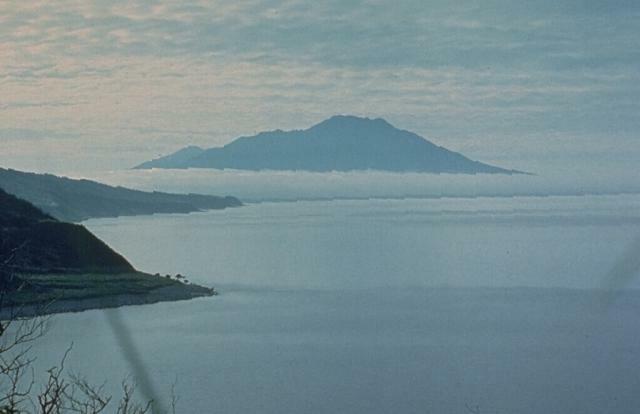 A late-Pleistocene or early Holocene stratovolcano formed an island that was later connected to Iturup. A 2-km-wide caldera was overtopped by a central cone that forms the present 1206-m-high summit. Strombolian eruptions have dominated the history of this basaltic volcano. Photo by A. Y. Antonov (courtesy of Oleg Volynets, Institute of Volcanology, Petropavlovsk). Conical Atsonupuri stratovolcano, it summit dappled by light snowfall, is seen here from the SW. The volcano forms a prominent peninsula joined to the SW side of Iturup Island. A 2-km-wide caldera was subsequently largely overtopped by a central cone that forms the present 1206-m-high summit. Strombolian eruptions have dominated the history of this basaltic volcano, leaving slopes susceptible to slumping and erosion. Only two historical eruptions are known at Atsonupuri, during 1812 and 1932. There are no samples for Etorofu-Atosanupuri [Atosanupuri] in the Smithsonian's NMNH Department of Mineral Sciences Rock and Ore collection. IRIS seismic stations/networks Incorporated Research Institutions for Seismology (IRIS) Data Services map showing the location of seismic stations from all available networks (permanent or temporary) within a radius of 0.18° (about 20 km at mid-latitudes) from the given location of Etorofu-Atosanupuri [Atosanupuri]. Users can customize a variety of filters and options in the left panel. Note that if there are no stations are known the map will default to show the entire world with a "No data matched request" error notice. Large Eruptions of Etorofu-Atosanupuri [Atosanupuri] Information about large Quaternary eruptions (VEI >= 4) is cataloged in the Large Magnitude Explosive Volcanic Eruptions (LaMEVE) database of the Volcano Global Risk Identification and Analysis Project (VOGRIPA).